In this tutorial we will show you how to use the transparency function in WinSpeedUp to make any window of an other application transparent. Start WinSpeedUp by clicking on "Start", "Programs", "WinSpeedUp", "WinSpeedUp". Click on "Customize" and select the "Transparency" tab. Now you will have to choose the window you want to make transparent. 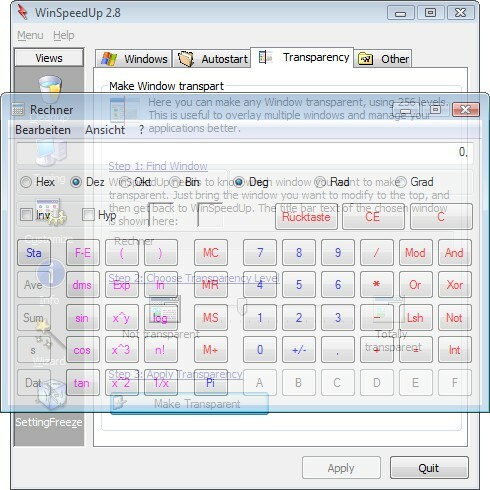 In this example we will make the Windows calculator transparent (you will see "Rechner" on the screenshots, which is the German name of the calculator). Start the calculator, wait 2 seconds when it has finished loading, and go back to WinSpeedUp. You will see "Calculator" below step 1. This indicates that WinSpeedUp has found the window you want to make transparent and is now ready so start. If you have problems making WinSpeedUp find the window you want to change: WinSpeedUp checks every second if an other window (program) is on the foreground and copies its caption below step 1. To select a specific window, set it to the front (by clicking on its titlebar), wait 2 seconds, and go back to WinSpeedUp without selecting any other window. Choose the level of transparency. There are 256 steps available, 0 meaning that the window is not transparent, 255 that it is totally transparent (and not visible!). In this example we choose 64 which is 33% transparent. The last step is to click on "Make Transparent". This will apply the selected level of transparency to the chosen window. On the screenshot you can see the calculator above WinSpeedUp. 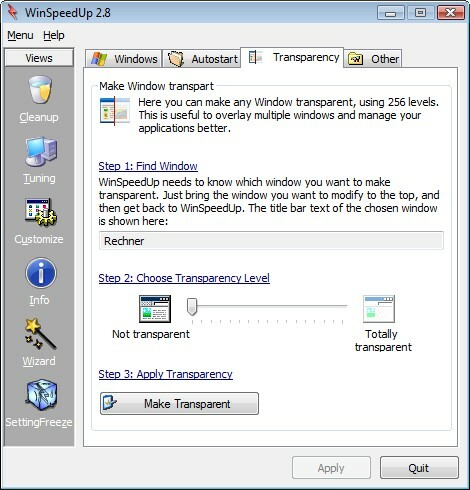 To make the window completely visible again, choose a level of 0 or close the transparent program and start it again. The transparency will stay even if you exit WinSpeedUp. I hope this tutorial helped you. If you have any questions related to this tutorial, e-mail me.